I Could Have Missed It All….. This past week was the annual Sage Summit Partner/Customer Conference which was held in Washington D.C. at the Gaylord Conference Center and Resort. I have been to every Sage Summit since its inception and more than a few when it was Insights. This Summit was a special one for me and if the doctors are right it will be my last so it was important for me to attend. Sage gave me the opportunity to say thanks to the Sage Community and also to tell the attendees what’s going on with my health. Joe Noll of Lancaster, PA showed me what an incredible human being he is, as did Dave & Cheryl from LDK Consulting. The love that the Sage community showed me was overwhelming. An example of this was when I was talking to Diana Waterman, an incredible human being and one of my favorite Sage employees, a gentleman walked up to us that I’ve never met and introduced himself as Pramod Gandhi from Dubai. In a very humble manner he asked about my health and then he said, “Bill, we are praying for you in Dubai.” You could have bowled Diana and myself over with a feather. It was then that I finally understood the global reach that my LinkedIn Group had accomplished. 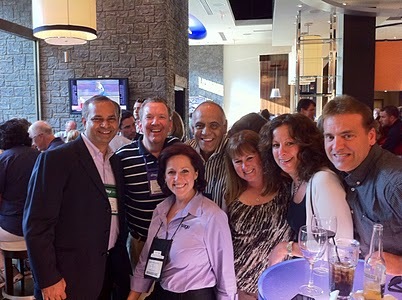 The entire week was like that for me from Sage executives to partners like Pramod. I had to conserve my energy so I didn’t go out to the parties. Today I’m wiped out and know that I will fall asleep right after takeoff but no matter I will take these memories with me on whatever journey I embark on. I do hope and pray that my doctors are wrong in their prognosis because I do want to live longer and spend more time with my sons and I sure don’t want to miss Sage Summit 2014 in Vegas. Please don’t stop being who you are. What I’ve found going through this process is that it doesn’t take much effort to make someone’s day just a little bit better as you did mine. I have been given money for the purpose of adding to my son’s college fund and also for liver cancer research. I hope this doesn’t come off as pandering but both are great places to donate money. Sage Summit 2013 – Are You In Or Are You Out? There has been much discussion about the value of attending Sage Summit 2013 Partner & Customer Conference, which is being held in Washington D.C. July 21 – 26 at the Gaylord National Harbor Resort. But I won’t miss it and neither should you! I’ve have found that Summit provides me with great value and relevant information. Our industry changes daily and there’s no way to stay on top of these changes if we don’t talk to the source(s). You can find the source(s) and other partners who have utilized those changes successfully by attending Sage Summit 2013. Most of the real interesting conversations are those that you find in the hallways between sessions and keynotes. If you want to watch a partner who is adept at deciphering what is said and more importantly what’s not said, find Wayne Schulz and ask him if it’s okay to tag along, he’ll probably say “no” but go anyway. It’s how he and I became friends. Its eye opening, informational and very rarely is his take on things wrong. I talk to Wayne 3-5 times a week and the conversation is always lively. You can catch Wayne on his daily morning walks at 6:00 a.m. along with other partners like Robert Wood, Peter Wolf & I swear I’m going to get up at Zero Dark 30 to walk with them. If sessions are your thing then go park yourself in every Ed Kless session that has an open seat. You won’t leave disappointed. I have sat in many of his sessions, taken the week long Consulting Academy, gone to conferences just to hear him speak and rate Ed as one of the top speakers in our industry. Look at the business partners and vendors who consistently attend Summit. If you want the keys to success they’re the people to see. Go to their booths and see what they’re doing that you’re not. It’s probably a safe wager that they’ve been involved in Summit for many years. There is a long term value of creating lasting relationships with other colleagues who will share their knowledge with you. I’ve spent many hours talking with them about the direction that our industry is headed. What price tag do you put on the information you receive at Summit? How about face time with Sage executives, visiting with 3rd party providers? I don’t think you can put a tag on these. The sessions alone that Sage offers are topic rich. We get caught up on doing work as we’ve always have not aware there are better ways to streamline our businesses & become more cost effective. If we don’t go to Summit & feed off the synergy then we’re going to stay in that same rut getting the same results. There are BP’s who have concerns that they don’t write any new business at Summit. They’ve bought booth space, & brought a large group. Is it worth the expenditure? Can I justify the costs? How much business will I miss out on while I’m at Summit? These are valid questions. The answer is simple….How much effort are you willing to exert while you’re there. If you’re going to Summit with the sole intent of closing deals you will be disappointed. It’s like going to the circus expecting Shakespeare; this is an unrealistic expectation. A lot of companies look at expenditures that don’t provide immediate return as worthless. I think of attending conferences the same as Spring Training, The chances of a productive year increase exponentially with a successful Spring Training. If you’re still not sold, here are 3 questions to ask yourself. ►By not going am I adding or taking away value from the success of my business? ► What new technology can I find at Summit that I can add to my product portfolio? ►Am I the problem or am I the solution? Come to D.C. & see what’s going on at Sage. You will go back to your business with new tools, ideas & a new attitude. See you in Washington D.C. Since starting 3 LinkedIn Network Groups, the largest is the Sage Partners, Employees, Alumni & Analyst with 7,500+ members in 60+ countries and the United States & the group has become a daily reading staple for many of the Sage NA executives. The group was created with the idea of members sharing ideas & opinions on current Sage changes, events & general take on the Sage environment with each other. Since May 2008 I’ve seen many mistakes that members continually make about setting up their LinkedIn profile & utilizing it to its maximum benefits. Does Anyone Really look like this? Does Remaining Anonymous Really Help? Pets & Children’s Photos Have NO Value on LinkedIn. If You Go To Spring Break Every Year & Consume Copious Amounts of Alcohol & Lose Your Clothes, Please Keep Those For Your Private Collection. These are but a few of the mistakes that I see people making but they seem to be the ones that continually show up. I get teased a lot because I don’t know how to pack lightly. I operate under the “You Just Never Know” Theory when it comes to travelling. A man writing a blog about what to wear to a conference? If you are Wayne Schulz or Robert Wood you pack 2 pair of socks, 1 pair of tennis shoes, 1 semi dress pair, 2 pair of Dockers, 2 Polo Short Sleeved Shirts, & assorted accessories. Nothing has to match, just has to be comfortable and ready. Sometimes I wish it were that easy for me. It just isn’t. I like wearing suits, sport coats & wool gabardine slacks with matching shirts & shoes. I probably spend more making sure everything is dry cleaned and laundered PRIOR to a trip that some people spend at the dry cleaners in an entire year. I’m not bragging, it is an affliction to which there is no cure. We’re only 3 weeks away from attending Sage Summit 2012. Prior to leaving San Diego I think that it’s time to get out the checklist. If you’re like me, you’ll discover that if I don’t prepare a checklist I’ll always end up 1 pair of socks short, too few business cards, forgot toothpaste, brought 2 bottles of shampoo, no conditioner. You name it, I’ve forgot it on one trip or another. That’s why I pack like I’m leaving for a year around the world. Belove I’ve included the average temperature & humidity for Nashville just in case you’re wondering about what to wear. Necessary Travel Documents √I enjoy wearing suits at conferences so I need those. I have to wear different shirts to match the suits, sports coats, etc. Of course extra socks & underwear are a must & different shoes for each suit are very important. There’s nothing worse than wearing a black suit & the wrong shoes or socks. This list looks like a list for a man, but it can be used just as easy for women. I think that someone could make a decent living as professional packers. Hand them your list, they go through it with you, and voila your only job is to get to the airport in time. She’s already packed your luggage in your car and included your entire itinerary and any other necessary documentation. One item that is HIGHLY recommend is a light coat. Longer Flights tend to get chilly and so do the Session Rooms. This reminder comes from #SageSummit so I would pay extra attention to it. Above all, get there safe and on time, dress accordingly and if the airline loses your luggage you can participate in one of my other favorite hobbies and that’s shopping. Gaylord Opryland has a couple of shops to purchase something new. Yeah, I know I’m a guy & I should honor the Man Code & not admit to enjoy shopping so much. There has been much discussion about the value of attending Sage Summit 2012 Conference, which is being held in Nashville in August at the Gaylord Opryland. Add to the mix that there have been many changes recently starting with CEO Pascal Houllion’s Opening Keynote last year about the new re-branding strategy to the recent “Journey of Transformation” announcements and one could come to the conclusion that attendance may be a bit light. But I won’t miss it and neither should you! I’ve have found that Summit provides me with great value and relevant information. Our industry changes daily and there’s no way to stay on top of these changes if we don’t talk to the source(s). You can find the source(s) and other partners who have utilized those changes successfully by attending Sage Summit 2012. In a following blog will be my Annual Top 10 Vendors/Booths to see. Don’t miss them! Most of the real interesting conversations are those that you find in the hallways between sessions and keynotes. If you want to watch a partner who is adept at decipher what is said and more importantly what’s not said, find Wayne Schulz and tag along. Its eye opening, informational and very rarely is his take on things wrong. I talk to Wayne 3-5 times a week and the conversation is always lively. You can catch Wayne on his daily morning walks at 6:00 a.m. along with other partners like Robert Wood . There is a long term value of creating lasting relationships with other BP’s or third party solution providers who will gladly share their knowledge with you. I have spent many hours talking with other partners, providers and executives about the direction that our industry is headed. How do you put a price tag on industry information you receive at Summit? What about face time with Sage executives? Where else can you visit directly with 3rd party representatives all in one room? Truth be told, you can’t put a price tag on these items. The sessions alone that Sage is offering this year are numerous in count, covering Sage products, upgrades, changes, new products etc. First, if you’re heading off to Summit with the sole intent of closing deals then you’re going to be disappointed. It’s kind of like going to a Barnum & Bailey Circus expecting Shakespeare and the best you get is the infamous Clown Car; or going on vacation to the North Pole in January wearing shorts, flip flops & sun tan lotion, with your surfboard and golf clubs; you’re going to be disappointed by setting up unrealistic expectations. A lot of companies look at expenditures that don’t provide immediate revenue as having no value. Unless there’s a dollar amount involved most Partners don’t get it. I think of activities like conferences the same as I do Spring Training, (that’s baseball for the uninformed.) The chances of having a productive year without Spring Training are very small, even for perennial powerhouses like the Yankees or the Boston Red Sox. To the partners who don’t get it, there are three questions you need to ask yourself. By not going am I adding or taking away value from the success of my business? What new technology can I find at Summit and add to my offerings to my customers and prospects? Am I part of the problem or am I part of the solution? Come to Nashville & see the changes that are happening at Sage and in our industry. You’re going to be surprised and more importantly you’re going to go back to your business with new tools, ideas and a new attitude and isn’t life itself about how you approach it? I think so and I hope to see each of you in Tennessee.